There are many tour boats that offer boat trips for tourists in the harbor of Alanya. Ships are modern but decorated like old ships. 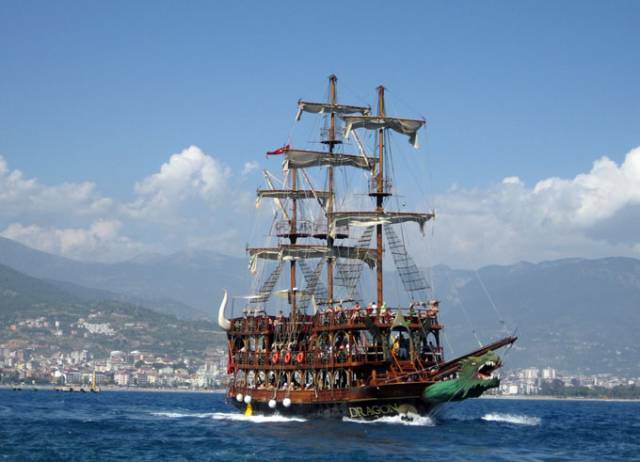 It is possible to take short tour on the sea near the fortress of Alanya by the ship. Tourists are offered also longer trips by sea. Ship made short stops for swimming during the trip. To buy boat tour is possible right at the port. The photo shows ships with tourists near Alanya. This picture was taken during a trip to Turkey in May 2013.